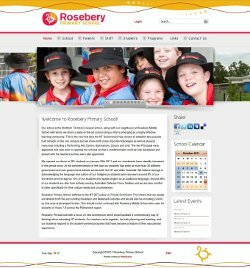 The new Rosebery Primary School website was launched today. As usual, Joomla has been used to create the website. For the web design, a customised version of the RocketTheme Maelstrom templatetemplate is installed with "RokStories" providing the banner slideshow on the home page. The "Easy Folder Listing" extension is used to make it easy for staff to add school newsletters etc to the relevant pages. "Appointment Booking Pro" is installed to take care of parent teacher interview bookings and "JEvents" is installed to display events. I used "Xpert Captions" for the first time to display thumbnails of the staff images. By hovering over a staff member, the beginning of the corresponding article is displayed and clicking on the text takes you to the article with the full details of the staff member and a larger version of the image.